Department of Botany is part of Institute of Biology and Ecology, Faculty of Science, P. J. Šafárik University in Košice. 1. Laboratory of karyologyequipped by a standard research microscopes and other facilities for karyological studies. 2. laboratory of flow cytometry equipped by a flow cytometer with a green laser 488 nm excitation wave, allows to detect relative (DNA ploidy level) as well as absolute DNA amount in plant material, endopolyploidy in plants as well as FCSS analysis for detection of ploidy level in embryo and endosperm in seeds. 4. laboratory of plant stress physiology equipped by FluorCam for measurement of chlorophyll a fluorescence, r-t PCR for gene expression experiments and western blotting. We will continue building our internationally recognized herbarium collection (acronym KO) and living cultures. Digitalization of the collection will continue as well, and we will work together with major European natural history collections in order to achieve their recognition as ESFRI infrastructure. Multivolume series: Mochnacký S. et al., 2013: Botanical Gardens and Arboretums of Slovakia. Satus, Košice, pp. 246. Herbarium collections are primarily concentrated on the Carpathian and Pannonian flora. It consists of several parts: 1. Herbarium collection of Lajos Thaisz, 2. Historical collection, 3. General herbarium collection. Herbarium collection of Lajos Thaisz consists of 983 herbarium specimens collected in the beginning of 20th century by Lajos Thaisz – the founder of scientific botany in Abauj – Tornya District. Index Herbariorum it is found with the abbreviation KO. Out of the 50,000 specimens in the Botnay collection, 1500 are Bryophytes and Lichenes. Library contains 4872 units of periodicals obtained in periodical exchange program, about 500 books concerning botany and related fields of interest. Botanical Garden keeps several types of living collections: 1.Greenhouse collection, 2.Arboretum, 3.Alpine and ornamental flora, 4.Autochtonous flora. Other important collections are from families: 90, genera: 2131. We possess also several collection of cultivars of different plants used as indoor plants in our region: Ficus, Dracaena, Monstera, Sansevieria, Marantha, Spatyphyllum, Fittonia. Further interesting specimens in greenhouse collection: Tropical and subtropical decorative flora are species and cultivars in families Orchidaceae, Cycadaceae, Bromeliaceae, Arecaceae, Zamiaceae, Euphorbiaceae, Begoniaceae. Arboretum grows woody plants autochtonous both to our region and other mild regions of the world. The most interesting specimens: Acer tataricum, Carpinus betulus, Colutea arborescens, Fraxinus ornus, Staphylea pinnata, Rhus typhina, Castanea sativa, Quercus castaneifolia, Quercus liban, Ginkgo biloba, Cedrus atlantica, C. deodara, Pinus banksiana, P. armandi, P. wallichiana, Zanthoxylum piperitum, Sequoiadendron giganteum. Alpine and decorative flora are species and cultivars Adonis vernalis, Leontopodium alpinum, Lilium martagon, Arum alpinum, Beckmania eruciformis,sortiment Sedum, Sempervivum, Saxifraga, Primula, Dryas, Astilbe, Aquilegia, Helianthemum, Armeria, Nymphaea alba, N. candida, N. tetragona, Epipacris helleborine (L.)Crantz, Cephalanthera damasonium (Mill.) Druce, Cephalanthera rubra (L.) Rich, Platanthera bifolia (L.) Rich and other. Cultivation of plants for research purposes. These collections are bound to current or recent (sometime also ancient) research projects solved by researchers working in the Botanical Garden. For research purposes we also cultivate plants in connection with Diploma theses and PhD. studies of students from the Institute of Biological and Ecological Sciences, Faculty of Science. A part of autochtonous flora collection is aimed also for plantation in expositions of autochtonous flora in the Botanical Garden. 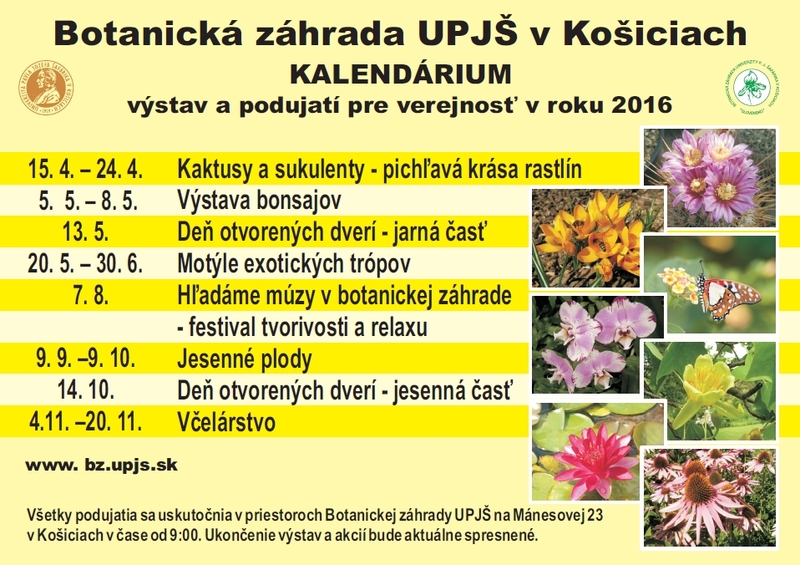 In 2015 there were 35 818 paying visitors in the Botanical Garden of P. J. Šafárik University in Košice. From this, 20 235 children and 15 583 adults. Children under 6 years old are admitted free to the Botanical Garden and we do not record their number. During exhibitions and events 29 655 people visited the Botanical Garden, 6 163 people outside exhibitions. In the Botanical Garden of P. J. Šafárik University in Košice there were 38 956 paying visitors in 2012, 38 665 paying visitors in 2013 and 36 836 paying visitors in 2014. Every year we organize several thematic exhibitions and events for visitors. In addition, we organize an educational program for primary schools and we participate in the University of the Third Age. In the future we want to continue at the set trend. On the Bachelor’s study programmes of Biology and Ecology, teachers of the Department participate on teaching of compulsory subjects:General Botany, Botany I (Systematic of ower plants), Botany II (Systematic of higher plants), Plant Physiology and management of theses. The Department guarantees Master study program of Botany and Plant Physiology, in which teachers of the Department teach compulsory subjects: Plant Taxonomy, Plant Metabolism, Physiology of Plant Growth and Development, Evolutionary Biology and Plant Ecology. Compulsory elective courses and elective courses in this and other study programs are Phytogeography, Mineral Nutrition and Pedology, Plant Embryology, Plant Stress Physiology, Biology of Plant Symbioses, Healing Plants, Seminar from Plant Physiology and Seminar from Botany. In the doctoral study program of Plant Physiology, there are disciplines: Selected Topics of Plant Physiology, Plant Ecophysiology, Reproductive Plant Biology and Plant Secondary Metabolism. Further improvement of living collections in Botanical Garden.